Algerians are taking part in a referendum on a government plan to grant a partial amnesty to Islamist rebels and government forces involved in the country's civil war. BBC Monitoring looks at some of the key issues in Thursday's vote. Q. What does President Abdelaziz Bouteflika hope to achieve? President Bouteflika says the adoption of the Charter for Peace and National Reconciliation will turn the page on over a decade of conflict in Algeria, which has claimed 150,000 lives and cost the country more than $30bn. The violence broke out between Islamic militants and government forces after the authorities scrapped an election in 1992 which the main Islamic party, the Islamic Salvation Front (FIS) was set to win. Q. What are the key points of the charter? It ends judicial proceedings for all those who laid down their weapons in 1999, following the president's clemency law, and those who vow to lay down their weapons now. It excludes individuals who were involved in massacres, rapes and who carried out bombings in public places. It rejects claims that security forces were responsible for the disappearance of thousands of Algerians. It provides for reparations for families of disappeared. Q: What is the current state of security? The run-up to the referendum has seen an upsurge in attacks by Islamists. Interior Minister Yazid Zerhouni said recently 800 to 1,000 militants were still active in the country. Q: What does the opposition say? Several opposition parties have called for a boycott of the referendum. Some critics have said the charter is an attempt by the president to boost his own power. 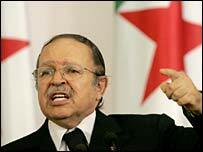 And one major opposition figure, Hocine Ait Ahmed, of the Front for Socialist Forces, accused President Bouteflika of holding the referendum "to blot out past crimes". Part of the charter says: "The Algerian people praise the Algerian National Army, the security forces as well as all the patriots and anonymous citizens who... saved Algeria and its institutions." Opponents say that without justice, there can be no reconciliation. They want the authorities to account for thousands of people who disappeared during the conflict. Q: Were opponents allowed to campaign against? No opposing views have been aired on national radio or TV. The Algerian Human Rights League has complained of alleged harassment of opponents of the charter, such as organisations representing persons who disappeared during the conflict. Q: What is the likely outcome? The BBC's correspondent in Algiers says the mood on the streets is one of unenthusiastic endorsement, but many Algerians seem likely to vote yes to the referendum, simply because they are tired of years of violence.